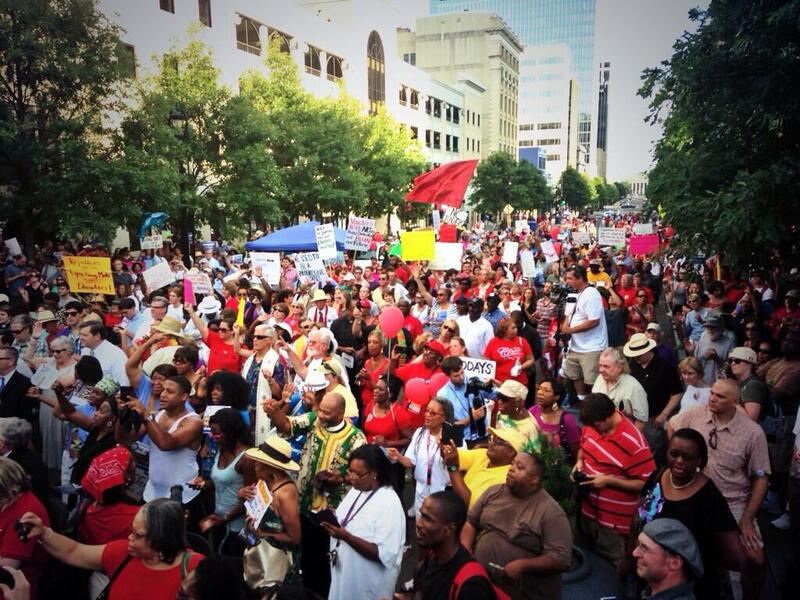 Moral Monday protesters rallied against the anti-worker Legislature. Teamsters were among the 10,000 Moral Monday protesters who marched through the streets of Raleigh, N.C., last night to voice their disgust for a slate of anti-worker initiatives approved by the Legislature this year. It was the largest of the weekly protests that resulted in 925 arrests for civil disobedience. Lawmakers gutted public education, cut taxes for corporations while raising them for working and middle-class families more and suppressed voting. They cut unemployment and Medicaid benefits. While elected officials disappeared after recessing for the year last week, demonstrators at the 13th Moral Monday event met on the Statehouse grounds before marching downtown through the state capital. Organizers plan to take the show on the road with similar protests scheduled to be held across the state in the weeks to come. The first is planned for Asheville, N.C., on Monday. We are pretty upset, even those people who voted for them. I can’t wrap my head around what they are trying to accomplish. Many protesters yesterday were teachers outraged about budget provisions that freeze their pay – already among the lowest in the nation – while ending tenure and taking away salary incentives for them to earn master’s degrees. Several said they could be forced to move elsewhere is search of fairer wages. Without a doubt, we are both thinking of leaving the state. And we believe there will be a mass exodus of teachers from North Carolina. Enough is enough. You can’t make a state better if we’re going to totally destroy education. Gov. McCrory and the Legislature are fulfilling the anti-worker agenda pushed by greedy billionaire Art Pope, an ALEC disciple and Benedict Arnold Koch brothers buddy who got himself appointed state budget director after financing a number of radical politicians’ campaigns. However, Moral Monday organizers -- led by the NAACP’s state chapter -- said they are not backing down and will continue through next year’s election.